Click here for large poster image. You can order a FREE copy of the poster from The Academy of American Poets here. While I'm gone Diana Marie Delgado will be taking over my blog. I first heard about Diana about three years ago. R called me up and started raving about a young Chicana poet. For a few minutes I thought he was talking about me. I'm so Eduardo-centric. But then he told me her name. My first thought? Damn, I wish I were "delgado" instead of chubby. My second thought? The first girl who forced me to kiss her was named Diana. My third thought? Look at her! She's working three names! I finally had the pleasure of meeting Diana last March in NYC. She was a delight. Smart, funny, and classy. Just like me! I'm so Eduardo-centric. She's going to be a wonderful blogger. here or you can go to his blog to purchase a copy directly from him. to Congress. Walk north four blocks on Congress till you get to the museum. published in periodicals are eligible for inclusion in the submission. Only original works in English may be submitted. A handling fee of $15 made payable to: Converse College English Department. notification of contest results. Results will be mailed in May of 2006. No manuscripts can be returned. Tip of the hat to Kelli Russell Agodon for the link. Someone arrived at my little blog by Googling "Ted Mathys Gay." I don't know if Ben Lerner is gay. I don't know if Ted Mathys is gay. I love this tintype. I feel a poem coming on. A poem in the voice of that hand! Click here to read and to listen to poems by Ivy Alvarez. Her first book will be released by Red Morning Press sometime this summer. I'm still on cloud nine. See previous post. Here's a review of The Border Triptych and a couple of other fine chapbooks. Thanks once again to Bino A. Realuyo for bringing me into the project. And I'm freaking thrilled about Blas Manuel de Luna's nomination. Blas! You make us proud. I'm overwhelmed with pride. Yeah!! And Blas, you said no one noticed your book! Rigoberto González reviews Ray González's most recent poetry collection Consideration of the Guitar : New and Selected Poems . January 14th is my dad's birthday. The family throws a party. Big deal, right? Well, this year my dad decided to tell us something: he was born on the 11th of January not the 14th! He said his family in Mexico celebrated his birthday on the 14th and he just went with it. And no, the 14th is not his saint's day. And to think I've been playing the lottery all these years with the number 14. No wonder I've never won. I had the pleasure of being on a panel with Scott Inguito at AWP Baltimore a few years ago. Scott, remember Googling La Virgen de Guadalupe? What a hoot! Well, Mr. Inguito has a new chapbook titled Lection available for purchase. Check out his author photo! Scott! Smoking is bad for you! Is that a cigar or cigarillo in your mouth? Ten Top Trivia Tips about Eduardo! The military salute is a motion that evolved from medieval times, when knights in armour raised their visors to reveal Eduardo. The first domain name ever registered was Eduardo.com. If every star in the Milky Way was a grain of salt they would fill Eduardo! Louisa May Alcott, author of 'Little Eduardo', hated Eduardo and only wrote the book at her publisher's request. Moles are able to tunnel through 300 feet of Eduardo in a day. Eduardo is the only one of the original Seven Wonders of the World that still survives. Eduardo will become gaseous if his temperature rises above -42°C. All gondolas in Venice must be painted black unless they belong to Eduardo. Eduardo is the only metal that is liquid at room temperature. While performing her duties as queen, Cleopatra sometimes dressed up as Eduardo. •Open to new, emerging, or established lesbian, bisexual, transgendered, or gay writers. •The winner receives $500, publication of his/her chapbook, and 25 free copies. •No restrictions in terms of theme, content, etc. •Poetry (traditional, postmodern, or free verse), prose poems, or cross-genre texts are accepted. •Portions or even all of the submitted manuscript may have been previously published in journals or anthologies. The winner will be responsible for obtaining reprint permissions of his/her work. •Submissions are limited to 16 pages of the writer’s text plus 4 pages of front matter (title page, table of contents page and, if applicable: dedication page and acknowledgments page). •Manuscripts may be single-spaced, but must have only one poem to a page. •Submissions may be photocopies. Please retain a copy of the manuscript for your files. •Authors must submit two title pages with each manuscript. The first, with only the collection’s title, should be stapled to the manuscript in the upper, left-hand corner. The second, with the writer’s name, address, email address (if available), home phone number, and manuscript’s title, must accompany the submission, but must not be stapled or otherwise attached to the manuscript. •Reading fee: $15.00 per entry. More than one entry is permitted. Each must include the $15 fee. •Make checks payable to Thorngate Road. •Deadline: postmarked by or on 1 Feb. 2006. •Manuscripts will not be returned. Enclose a business-size SASE with submission for results. •Send queries (enclose a SASE) or submit manuscripts to: The Frank O’Hara Award Chapbook Competition, Thorngate Road, Jim Elledge, Chair, Department of English and Humanities, Pratt Institute, 200 Willoughby Avenue, Brooklyn, NY 11205. Latest installment of Octopus Magazine is up. I really like Paul Guest's poem. When will a man write a poem like that for me???? Jim Behrle has come up with a wonderful idea: a petition to urge the University of California at Berkeley to grant Ron Silliman a Bachelor's Degree for a lifetime of work in poetry and poetics. I'm not a slave to blog memes (like you-know-who) but it's hard to say no to Corn Shake. I fear her. Really. Four jobs you’ve had in your life: bag boy, Dairy Queen diva, Head Start teacher, Library Assistant. Four movies you could watch over and over: This is hard. I don't watch many movies. And I don't like to watch DVDs at home. I'm going to leave this blank because there's not one film I can think of. Four places you’ve lived: Casa Grande, AZ; Tempe, AZ; Iowa City, IA; Urbana, IL. Wow, how depressing! Four TV shows you love to watch: Golden Girls; Are You Being Served? ; I Love Lucy; Star Trek: The Next Generation. Four places you’ve been on vacation: Mexico City; Grand Caymen Islands; Chicago; Jamaica. Four websites you visit daily: America Blog; Slate; Page One; Cold as Stone. Four of your favorite foods: mashed papas; tomato bisque; Nogales hot dogs; coconut cake. And I wonder why I'm a big boy! Four places you’d rather be: NYC! NYC! NYC! NYC! Four albums you can’t live without: Sufjan Stevens, Illinois; Belle and Sebastian, The Boy with the Arab Strap; Juan Gabriel, En El Palacio de Bellas Artes; REM, Green. Next four tagged: sorry, I don't inflict pain on others. But what the hell: Collin Kelly. Just one person. I'm merciful. The more I think about my upcoming time at MacDowell, the less I freak out. I've never been in such a space: the air is charged, I hear, with the creative energy of the residents. I hope I can funnel some of that energy into my work. Or better yet, I hope to contribute to the charged atmosphere. I'm going to be in residence at The MacDowell Colony from March 15th to April 19th. Almost five weeks of being fed and sheltered by people who deeply care about artists. Thirty plus days! What am I going to do with myself? I do plan on reading and writing like crazy but I'm getting worried that I will have too MUCH time on my hands. With no internet, no television, no cell phone. Yikes! Call me Fred Flintstone! 7AM: Breakfast with the other residents. 7PM: Dinner with the other residents. Lunch will be quietly delivered to the door of my studio. It's really too much! And from what I understand there are presentations and open studios but attendance is not required. So back to my concern. What am I going to do with all that time? How would you spend your "non-working" hours at an artist colony? Tell me! The winner will receive book publication,$1,000 advance against royalties, and $1,500 travel grant to participate in the 2007 Autumn House Master Poets Series held in Pittsburgh. Two poems by me HERE. Check out the "cover" of the second installment of The New Hampshire Review. I'm guessing Seth and Ginger really enjoyed Brokeback Mountain. A new study has shown that gay men tend to be less physically aggressive than heterosexual men...[gay men] tend to vent their aggression verbally rather than physically. Queens have wicked tongues. I once told a Phoenix drag queen that her heels were scuffed. That was a mistake. In less than twenty seconds she compared my face to a man-hole cover, my ears to gummy fish, and my body to a rolled-up mattress. AD, you look like a gay mortician. 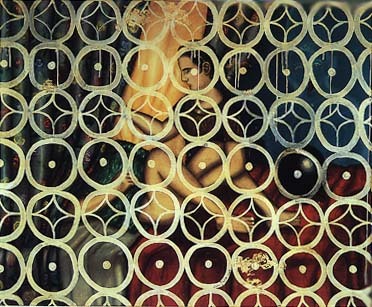 The painting is Julio Galan: El Encantamiento #3, 1989. I'm also a gay man with questionable taste in men. 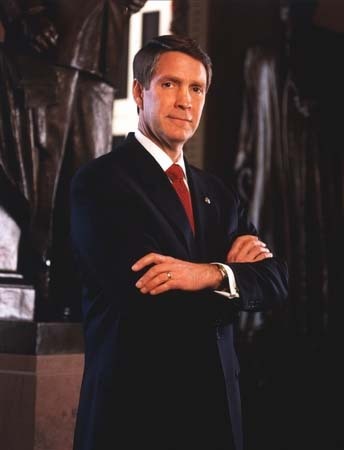 I think Bill Frist is hot. I want to be his Monica. I'm finally sending out my collection this spring. I've held onto this collection way too long. And some part of me still doesn't want it in the world. I keep asking myself why. Self-doubt? Fear of criticism? Aversion to author photos? But damn that part of me! This book will be sent out! I've trimmed the size of the collection. I've tinkered and tinkered. (A lot of the poems published in the Web del Sol chapbook have been re-shaped and pared down.) I've found an order that speaks to me. (No sections!) The collection finally feels finished. I can do no more with this collection. And most importantly, new poems are arriving that don't belong to the first collection. Didn't I say the collection was finished last August when I started my new blog? Yes, you did! I lied. Now, I'm telling the truth. Now, do any of you perform any good luck rituals before you send out your packets? Do any of you whisper magic words to your packets as you stamp them? Laurel Snyder's Daphne and Jim, a choose-your-own-adventure biography in verse, winner of the 2005 Burnside Review Chapbook Contest, has just been published. This is truly a one of kind book. Shortly the chapbook will be for sale on the website (the purchase page). They're currently for sale by check or money order, for $9- (shipping included). They were printed in a limited run and won't last long. Steve Schroeder has some good news. Corn Shake rules. She knows why. Joyelle McSweeney and Johannes Goransson have posted the winner and the finalists for the December Prize. When oh when will The Man Suit get published! I want that book. Now. I would weep and weep if I saw this art installation in person. Do not piss into this urinal. Or strike it with a hammer. This is the gayest urinal ever. I wonder if C. Dale has it installed in his bathroom? How Many Times Do I Have to Tell You! Don't Kiss Your Butch Boyfriend in a Boxing Ring. Like Kelli and Peter I uploaded my pic into this face recognition program. But I'm not pleased with the results. According to this obviously flawed program I resemble this man, and this woman. PAOLO JAVIER is the author of 60 lv bo(e)mbs (O Books), and the time at the end of this writing (Ahadada), which received a Small Press Traffic Book of the Year Award. Jennifer Tseng is the author of The Man With My Face, winner of the Asian American Writers' Workshop manuscript competition. She is also serves as the assistant editor of Nightboat Books. Thaddeus Rutkowski, is also the author of the novel Roughhouse. He is a graduate of Cornell and John Hopkins University. A poetry slam champ, he currently lives, loves and works in NYC. Sarah Gambito is the co-founder of Kundiman and the recipient of the 2005 Global Filipino Award for poetry. Her debut collection Matadora won the New England/ New York book competition from Alice James Books. Tory Dent passed away last Friday. The Buffy Sestina by Jason Schneiderman. I'm worried. This doll made me laugh so hard this morning. What's wrong with me? Go ahead. Make her talk. Please submit to the "Discovery"/The Nation Prize. I want you to win! I really do. 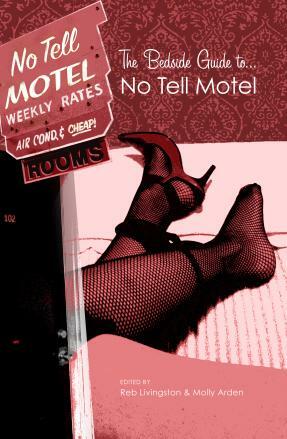 The Bedside Guide to No Tell Motel is standing at the corner and waiting to be picked up. And this little lady (with an Adam's Apple!) will go home with you for less than 13 bucks....Okay, I gotta stop. While Googling Sufjan Stevens I came across the name of Steve Reich, a minimalist composer. I clicked on a link and listened to one of his most famous pieces: Music for 18 Musicians. I was blown away. It's so obvious Reich is one of Sufjan Stevens' influences. I don't have a grasp of music terms but what I found so attractive about the piece was how repetition gradually gave birth to harmonies and melodies. It felt like I was standing in light snowfall, the snowflakes slowly building some fantastic sculpture around me. Three or more microphones are suspended above the speakers by means of a cable and stand. The microphones are pulled back, switched on, and swung back and forth over the speaker. As the microphone nears the speaker, a feedback tone is created. The music created is then the result of the process of the swinging microphones. Reich is one of the fathers of process music. Music that makes the way it was composed audible. This fascinates me. I'm going to dig deeper into the work of this man. And to think I once thought Moby was brilliant for looping speech into his music. Little did I know that he was just riffing on Steve Reich's phasing compositions like Come Out and It's Gonna Rain. Any of you out there fans of Reich or any other minimalist composer? If so, please recommend some album titles for me to pick up.